In this weekend, totally three Malayalam films will treat the Kerala and Malayalam speaking people around the world. Basheerinte Premalekhanam, Theeram and Team 5 are the list of films which set to release in the theatres on July 21st Friday. 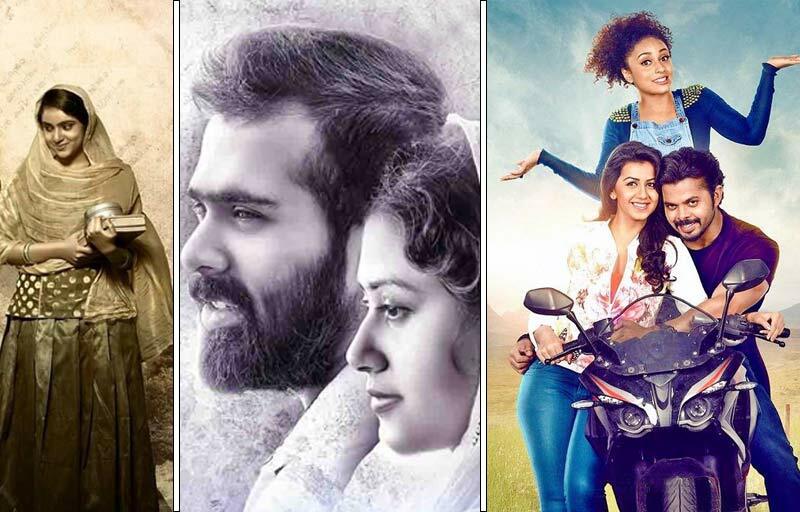 After postponed many times, all these small budget films are releasing in this weekend. While two other films have postponed from this week were early scheduled to release on this weekend. Ramaleela and Kadam Kadha are the two films which will release on upcoming dates. Due to the judicial custody of Dileep, who alleged involvement in the abduction case of the co-actress. His political thriller Ramaleela is postponed and yet to announce the release date. About Basheerinte Premalekhanam: The romantic family drama film which directed by Aneesh Anwar with the star cast of Farhaan Faasil and Sana Althaf as lead. According to the story of the film, it is the love and family drama which happened in the 1980s. Apart from the lead roles, Madhu, Sheela, Aju Varghese, Manikandan, Renjini Jose and Sooraj Harris are played in supporting roles in this flick. All the three films in this weekend will be screened without any big names in lead. So, all the three makers released their promo videos of the film and impressed the audience. The Basheerinte Premalekhanam Trailer starts with the intro of old and classical radio and Onida TV. What are all the changes happened in that village after brought TV from abroad? Watch it on theatres that the film will release on July 21. About Team 5: After a long gap of entertainment in a Sports, the former India cricket player Sreesanth is ready to entertain in a Cinema. He will appear as a lead hero of the film, Team 5 in the Malayalam film which also released in Tamil and Telugu at the same release date. Suresh Govind is the director of this film who narrated a story of a gang of bikers those who all involved in the race. Irene (Nikki Galrani) is the female lead, who is the lover of Akhil (Sreesanth). Pearle Maaney and Makarand Deshpande are the supporting actors of this film. Akhil is the leader of the gang that participates in racing tournaments while facing tough competition with their rival gang Road Rollers led by Alby (Sumesh Krishnan). While Irene is the event manager of the tournaments. How Akhil falls in love with Irene? The answer will be screened on this Friday. About Theeram: The late actor Ratheesh’s son Pranav Ratheesh is all set to appear on big screen as the first time with the film, Theeram. Saheed Arafath is the director of this simple love story which happens around Alappuzha in Kerala. The character of Pranav Ratheesh is the auto-rickshaw driver, whose name is Ali. Maria Yohannan is the female lead of this film, who is a Muslim girl and she had a love with Ali. Suhra is the character name of the Maria in this flick. Tiny Tom will appear on the screen as an antagonist in the flick. Also, Askar Ameer is the brother of actor Ajmal in a pivotal role. The movie all about the simple love is set to hit on July 21, 2017. If you like this update, then share it with your friends on Facebook, WhatsApp and other sources.